It is the: ‘New Kapheus Spiral of Life Bracelet. This bracelet is made of a hemp rope adjustable leather strap, so one size fits all’. 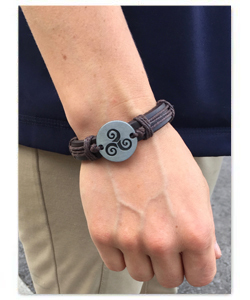 It is the: ‘New Kapheus Spiral of Life Wrist Band. This wrist band is made of a hemp rope adjustable leather strap, so one size fits all’.